Buckingham Palace, London: Built originally by the Duke of Buckingham, Buckingham Palace was purchased from him in 1762 by George III, who moved there from St. James's Palace. The building was reconstructed between 1825 and 1836 in the Palladian style from the designs of John Nash, and it has since undergone several additions, an East front being built in 1856. Now the home of the Queen, it attracts crowds every day to watch the Changing of the Guard, and the comings and goings of the many visitors to the Palace. One color postcard with a divided back. 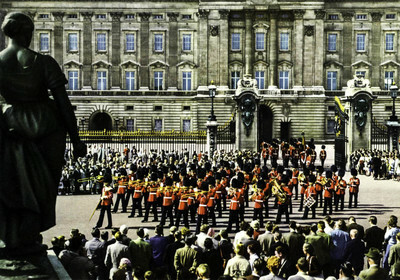 The postcard was published by John Hinde in London, England. This is a pic of London – a really [illegible] city. Yesterday we toured Stratford- a very quaint little town – Shakespeare country. We all enjoyed the ship and Europe is really wonderful. Your loving child, Ann Gidy.